The sky is gray, and leaves are twirling down from their trees, rustling underfoot and reminding me that fall has arrived. This chilly air makes me crave hearty winter meals. Risotto with radicchio and smoked mozzarella… Chicken cacciatore over polenta… Fresh minestrone… But it’s not quite winter yet. 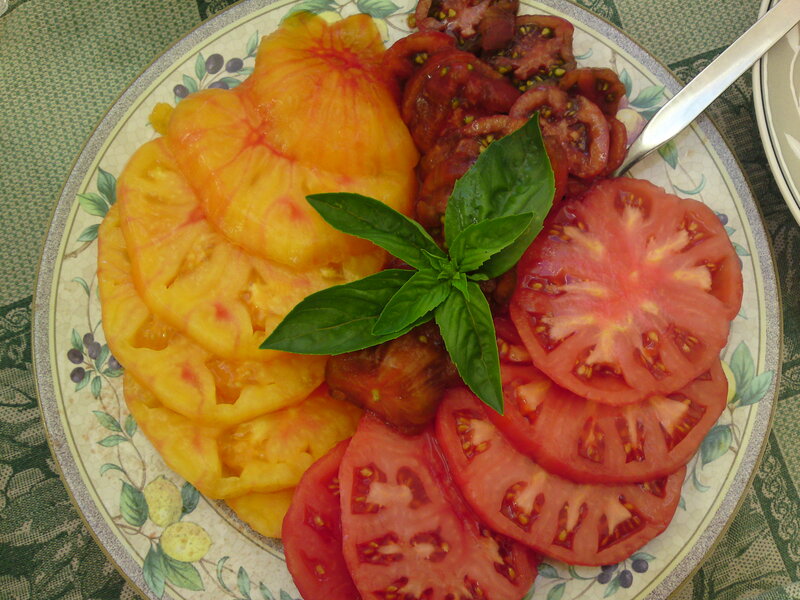 Tomatoes and squash are still ripening in the garden, and the basil is just begging to be gathered before an early frost turns its gorgeous green leaves to brown. Yes, yes, yes, it’s PESTO TIME! First, I’d like to share a little something that those Google folks did in honor of John Lennon’s birthday that made me smile just now. Doubt their video banner will still be active by the time I post this, so here’s the clip on you tube. Thanks, John, for the melodies and the memories. I love basil. It’s as if summer is giving me a kiss every time I smell its essence. There must be hundreds of ways to use this herb, from a hint of fresh leaves in a salad, a garnish in an appetizer, or front and center as a pasta sauce. 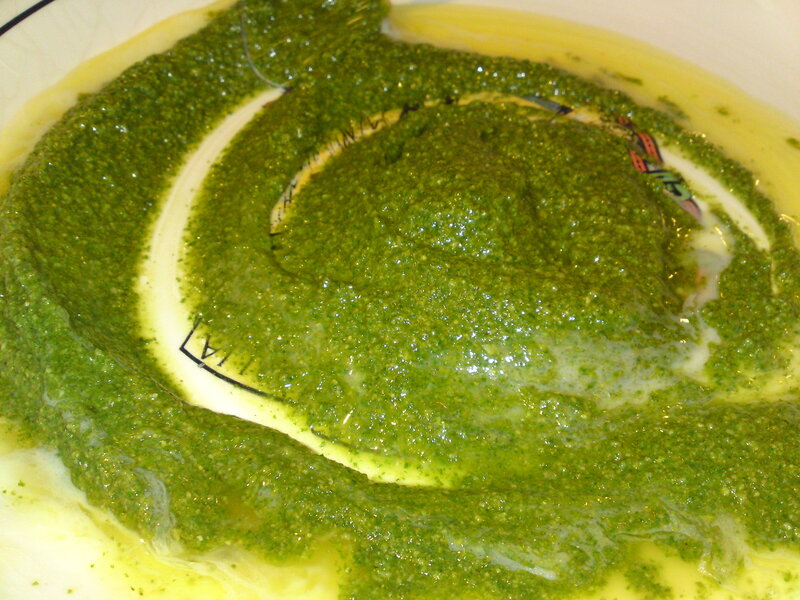 Some form of Pesto has been around since Roman times, but the northern town of Genova and the surrounding Ligurian countryside lays claim to its most beloved form, Pesto alla Genovese. 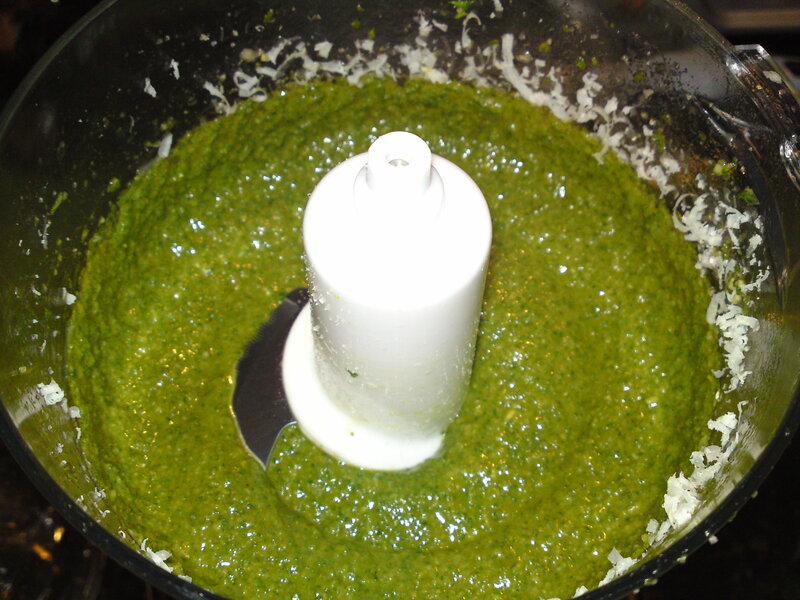 Now there are probably as many methods of making pesto as there are inhabitants in Genova (over a million), but I’m going to stick with the basics. First, a recipe with set measurements, using either with a blender, food processor, or a marble mortar and pestle, adapted from one of Marcella Hazan’s cookbooks. Second, the all’occhio method (eyeball) — as in you start with some of this, add some of that, and mix until it looks and tastes just right. I probably would have stuck with the set measurements had we not recently hosted visitors from Liguria. On their last morning here, Marilena took the time to share her pesto recipe with me, and I learned a couple of things I’ve never read in any recipe book. Adhering to my belief that recipes are best when they’ve evolved, I prefer the all’occhio method — as in: the measurements are only a guide, so tweak it until it suits your palate. 1 pound of spaghetti (or fettuccine) – Usually serves 4 to 5, but I’ve seen a party of two devour this dish in a flash, so servings depends on who’s eating. Add the basil, nuts, garlic and 1/3 of the salt to the mortar and crush it against the sides by turning the pestle in a circular motion. Keep crushing until the mix turns into a paste. Add the cheese and crush until evenly blended. Add the olive oil a spoonful at a time and continue mixing with a wooden spoon until all the oil has been added and the pesto is evenly blended. Meanwhile, cook your pasta al dente. Strain and reserve 2 T of the water. Put the pasta back in the cooking pan, add the butter and stir to melt. Add the pest and stir. If it seems too dense, add the hot cooking water, a bit at a time, until it coats the pasta well. Put in the basil, oil, nuts, garlic and salt and mix on high, occasionally pausing to scrape the sides. 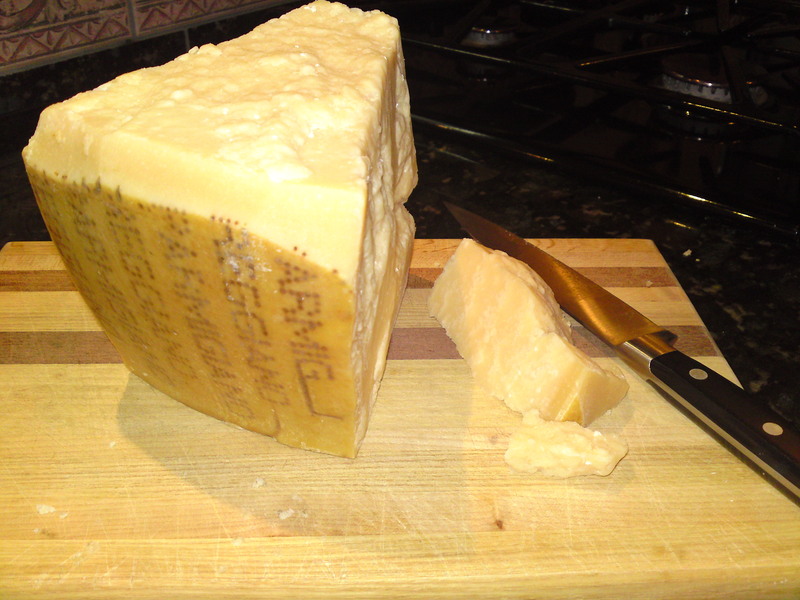 When evenly blended, pour into a bowl and mix in the cheeses by hand. I call this method All’Occhio (eyeball) because Marilena doesn’t measure a single ingredient. She pinches salt and cups basil and streams olive oil until the mix looks and tastes just right. While she scooped pine nuts out of their bag, I waited with a tablespoon so I could at least offer you a starting point. (The garlic and salt, for instance, are 1/4 of what’s called for in the above recipe. Adjust to suit your taste.) And once Marilena cupped the quantity of basil she wanted to add in her hands, I had her dump it onto a food scale, which seemed more accurate than a measuring cup. True pesto is served crudo, or raw, so never allow your basil to overheat either when preparing the sauce or mixing it with the pasta. If you’re mixing by mortar and pestle, you don’t need to worry. However, if you’re using a blender or food processor, do not mix for more than 30 seconds at a time. Always lightly rinse your cooked pasta with cool (not cold) water. Boil salted water for your pasta, and cook al dente. Meanwhile, make your sauce. 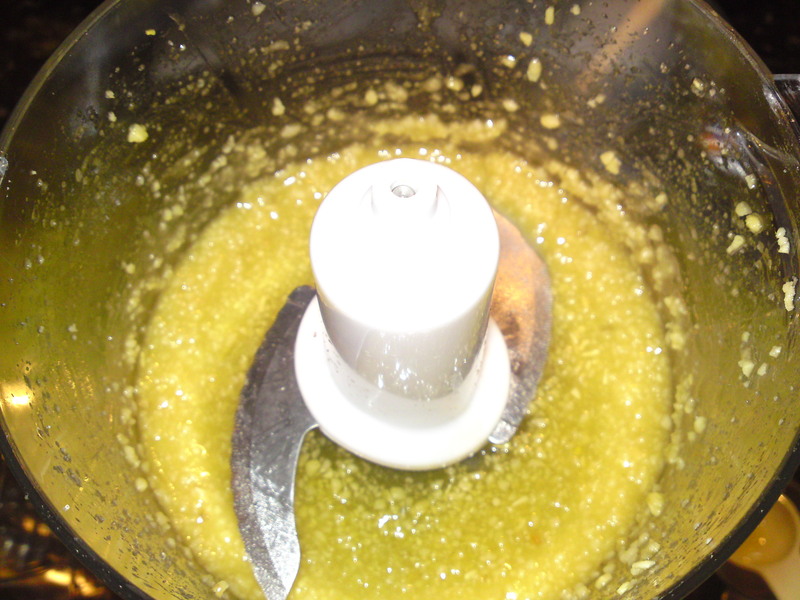 Crush garlic and blend in food processor with the salt, pine nuts, and a couple of tablespoons of oil until it is nearly a paste. Do not worry about overheating. 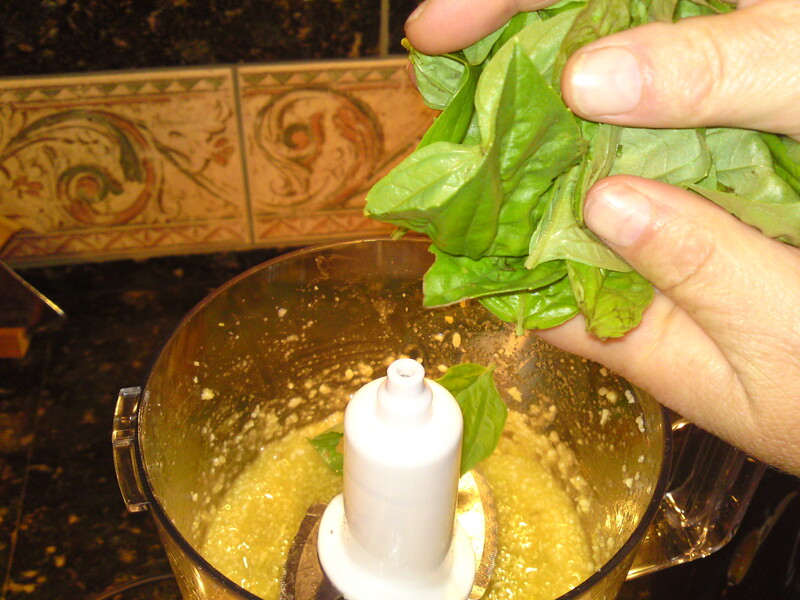 Add 1/4 of your basil to the garlic paste. As you start to blend, drizzle in just enough oil to keep the mix moving. Do not mix for more than 30 seconds at a time, and rest for 15 seconds between blending. 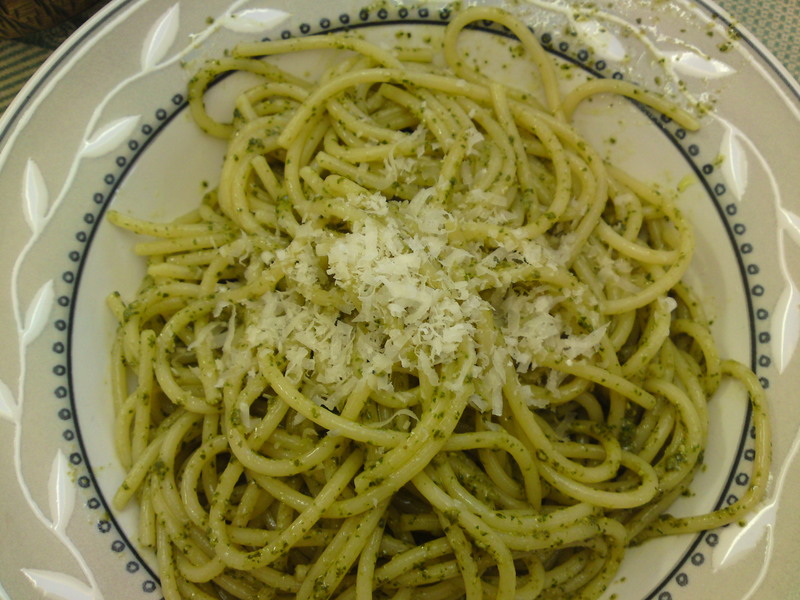 Pour melted butter into your serving dish, add 2 tablespoons of pesto per serving, and mix. When your spaghetti is al dente, scoop out a couple of tablespoons of the cooking water, and then strain the pasta. Rinse briefly with cool (not cold) water to cool the pasta and to keep the basil from “cooking.” Toss with the sauce in the dish. (Don’t forget to add the appropriate ratio of cheese if you haven’t already.) If necessary, add a bit of the cooking water at a time until the sauce evenly coasts the spaghetti. 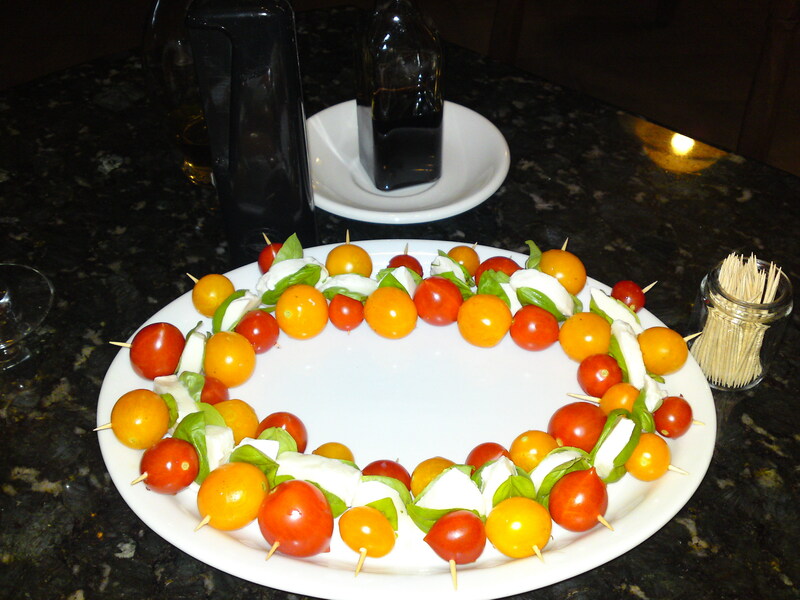 Serve with a light side dish such as a selection of fresh, sliced tomatoes. Wash the green beans, and break into 1 inch sections. Fill a pasta pot with enough cold water to boil your pasta, add the green beans, and bring to a boil. Meanwhile, peel your potatoes and chop into 1/2″ cubes. After the beans have boiled for 2 or 3 minutes, salt the water as you usually do for pasta, add the pasta and and the potatoes and boil until the trenette are al dente. 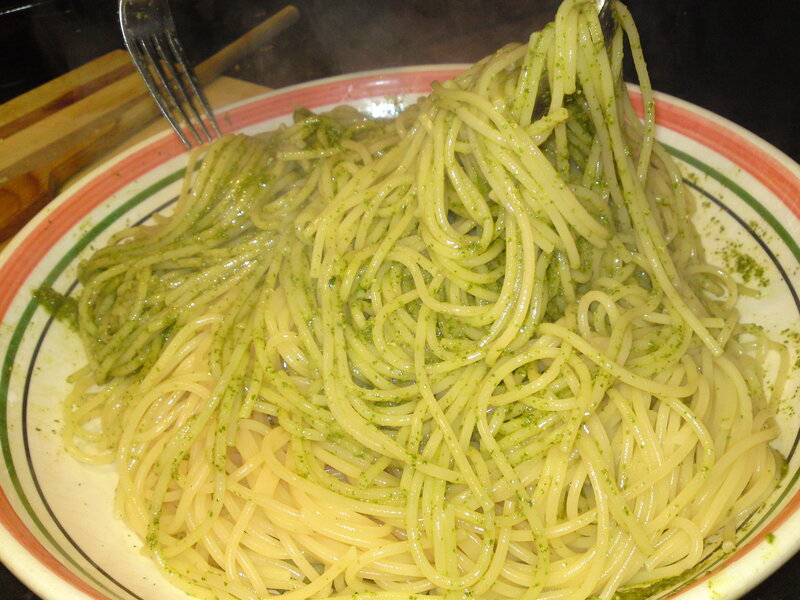 Save a couple of tablespoons of the cooking water, strain the pasta, beans, and potatoes, and mix with butter and pesto in your serving dish as described above. Place extra sauce in a small glass (preferable) or plastic airtight container. Top with a drizzle of olive oil and store in the refrigerator for up to one week. portion-size Ziplocks, making sure to force all the extra air out of the bag. Defrost without opening the Ziplock (so it won’t turn brown). Speed up the defrosting by soaking the ziplock in lukewarm water. cubes by placing 2 -4 tablespoons in each section an ice tray. Top with a drizzle of olive oil and freeze. Store frozen cubes in Ziplock bags. When it’s time to use, consider 2 tablespoons for each serving of pasta (100 – 125 grams, or app. 1/5 to 1/4 pound). Stir in the cheese at the last minute and toss with buttered pasta. If you’d like to save extra basil without making it into pesto, click on the pizza link above in Variations for my preferred method.